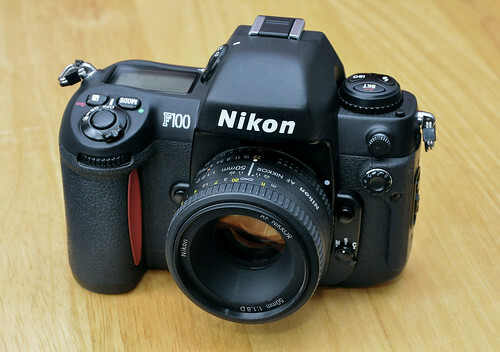 The Nikon F100 is an automatic-focusing 35mm SLR camera released by Nikon in 1999. 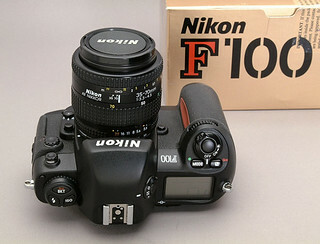 The F100 replaced the F90X in 1999, accompanying the F5, as the early Nikkormats did the Nikon F. The F100 inherited the F5's ergonomics and added further improvements. The camera is discontinued, but as of (2012) sill available for purchase new from many dealers. The top view of the Nikon F100 shows a well organized positioning of command dials and other controls. This layout has become the standard for expensive Nikon models from the F6 to the very recent D700. The camera was positioned as professional but more affordable than the F5. Although about twice the price of a F90X, the price tag was attractive in comparison with that of the F5. To achieve this, the F100 used more plastic parts and a brass lens mount; has a fixed finder, and lacks mirror lock-up, eye-piece shutter. Despite these cost-cutting measures, the F100 was highly regarded, competing with the F5. The MD15 makes the F100 look very similar to the F5. 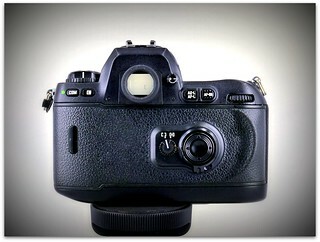 Although it doesn’t change the camera performance much, attaching the MD15 to the F100 assures a firm hold on the body. When using larger and heavier lenses, the use of the MD15 becomes more or less a necessity. This page was last edited on 28 December 2015, at 05:06.